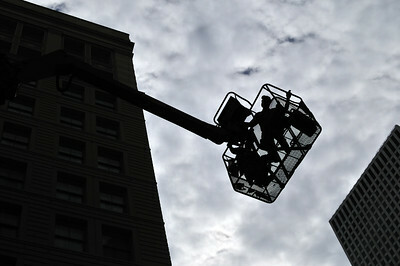 October 24, 2009 - Two men control an aerial work platform above Carondelet St. in the Central Business District of New Orleans. 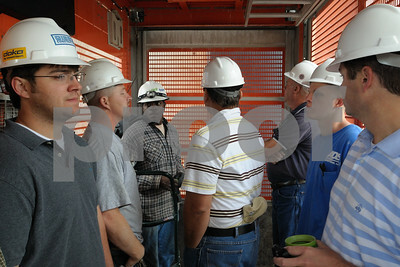 October 23, 2009 - Construction workers and contractors ride up an elevator at the site of a new apartment development being built at 930 Poydras in the Central Business District of New Orleans. 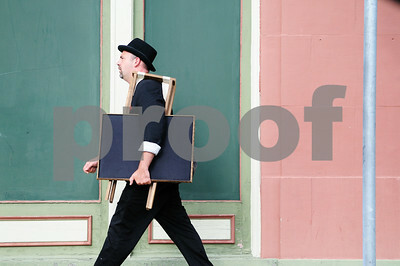 October 23, 2009 - A street artist walks down Camp Street in downtown New Orleans. October 23, 2009 - Brian Gibbs, developer for a new apartment building going up at 930 Poydras in the Central Business District of New Orleans, talks about the buildings and development surrounding his construction site. 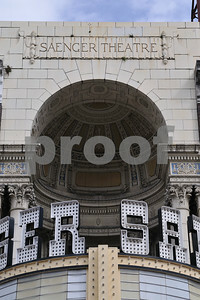 October 23, 2009 - Skyscrapers overlook a statue on the rooftop pool deck of the Le Pavillon Hotel in downtown New Orleans. 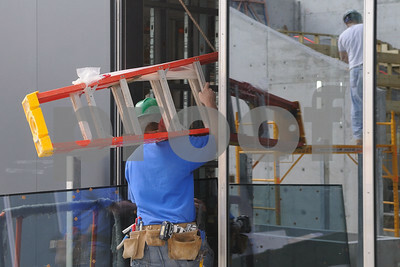 October 23, 2009 - The hand of a construction worker comes into view as he walks up the stairs of a new apartment building under construction at 930 Poydras in the Central Business District of New Orleans. 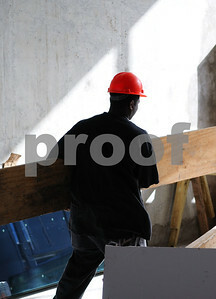 October 23, 2009 - A construction worker carries a large board in a new apartment building under construction at 930 Poydras in the Central Business District of New Orleans. 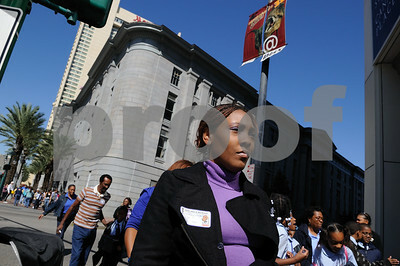 October 23, 2009 - A woman walks with a group of school children down Canal Street in downtown New Orleans. 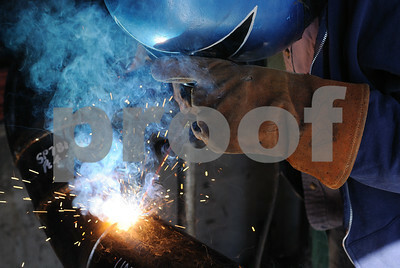 October 23, 2009 - A welder works on the cooling system pipes on the roof of a new apartment building under construction at 930 Poydras in the Central Business District of New Orleans. 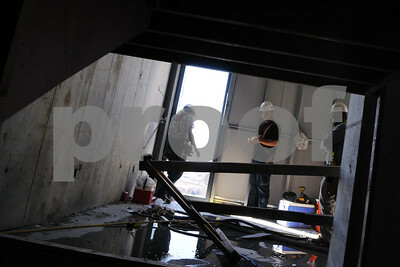 October 23, 2009 - A group of construction workers in a future upscale apartment building at 930 Poydras in the Central Business District of New Orleans. 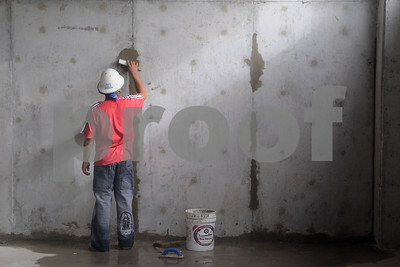 October 23, 2009 - A construction worker works on the concrete wall of what will eventually be the fitness center in a new apartment building at 930 Poydras in the Central Business District of New Orleans. 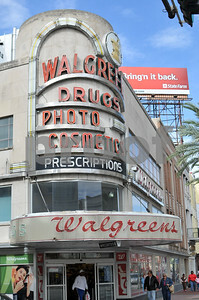 October 23, 2009 - Jeannie Tidy, Real Estate Development Manager for the Downtown Development District of New Orleans, explains an artist's rendering of the future theatre district on Canal and Basin Streets. October 23, 2009 - Jeannie Tidy (center), Real Estate Development Manager for the Downtown Development District of New Orleans, shows an office space to potential leasers. The building recently received a grant to upgrade the faade, which has helped attract people interested in leasing out the space. 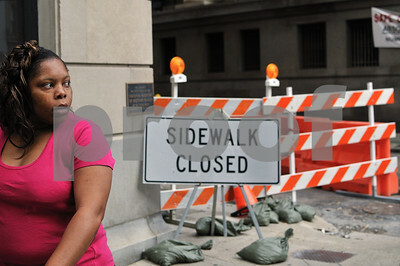 October 24, 2009 - A woman walks down the street in front of the Maritime Building in downtown New Orleans. The Maritime Building is under construction as part of a $24 million project, which will include 112 apartments. 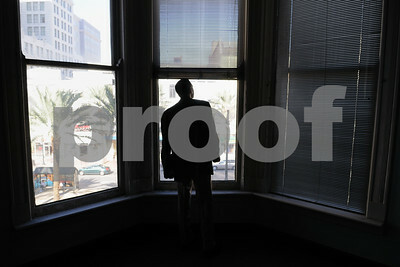 October 23, 2009 - Ryan Bordenave, Retail Attraction Specialist for the Downtown Development District of New Orleans, inspects an office located above a clothing store on Canal Street. The Downtown Development District is working to attract businesses back to the downtown area. This building recently received a grant to upgrade the faade, which has helped attract businesses interested in leasing out office space. 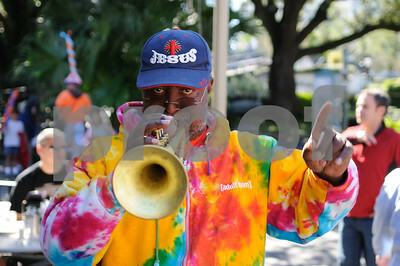 A street performer outside of Café du Monde in New Orleans, Louisiana. 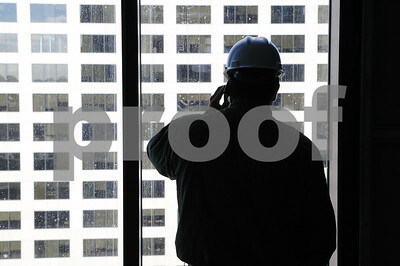 October 23, 2009 - Brian Gibbs, developer for a new apartment building going up at 930 Poydras in the Central Business District of New Orleans, talks on his cell phone while looking out a window of his building under construction. 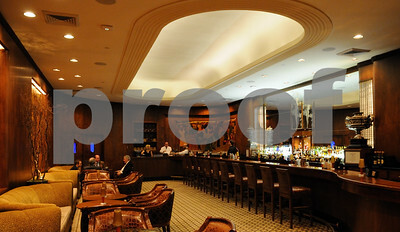 October 23, 2009 - The Sazerac Bar in the recently renovated and reopened Roosevelt Hotel in downtown New Orleans. 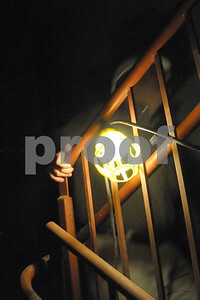 October 23, 2009 - A construction worker carries a ladder into an upscale townhome on the sun deck of a building under construction at 930 Poydras in the Central Business District of New Orleans.